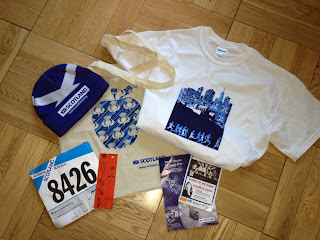 Today I had to trek it up to 89th street to the NYRR office to pick up my stuff for this Saturday's Scotland Run 10K. In all honesty, I probably shouldn't be running this race because of my IT Band, but I have been looking forward to it for so long ( I signed up the day it opened!) that I can't bring myself to skip it. My goal is to run it nice and easy and hopefully I won't have too much pain (crossing my fingers). To prep myself, I'm foam rolling like I've never foam rolled before and icing on and off all day long. Super fun. Add some American Idol results into the mix and its a party! Really though, I really just wish I could just cut the IT Band out of my leg as a quick fix... damn human anatomy. 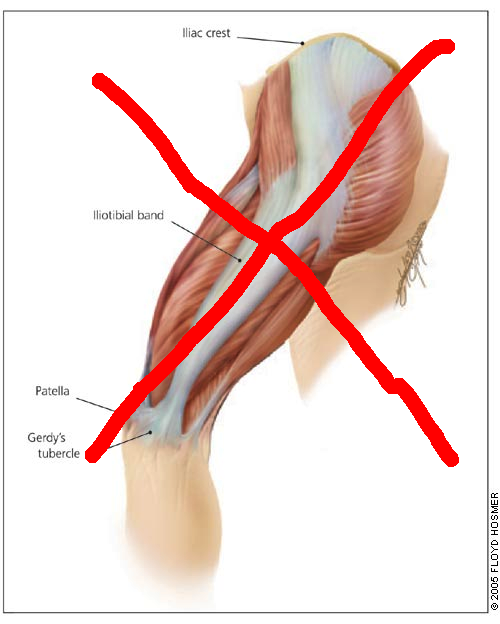 I hate you IT Band. So today when I picked up my gear I noticed it wasn't the usual NYRR t-shirt and race bib only. There was an actual "swag bag", which I wasn't expecting at all for a smaller race. Since its a Scotland-themed event, all the items in the bag were based on... you guessed it: Scotland. Even the shirt was cuter than usual. Very nice, NYRR, very nice. I wish I had bought a cute Scottish hat or something when I was over in Edinburgh last May with my sister Jen. I would have had something authentic! But no, I was too cheap that day. I did, however, eat haggis at the insistence of my sister. If you don't know what that is, look here for a description. Thankfully I didn't read that before I ate it, although my haggis looked more like meatloaf than the one on Wiki. Thanks Jen for encouraging me to eat that (it actually did taste good!). I love me some bagpipes. On a separate note, I finally watched the makeover episode of the Biggest Loser. Those are my favorite types of episodes because they are so emotional and inspiring! I will say that I teared up like a 2 year old little girl at certain points during the show, but I'm always the first to admit that I can be over-emotional and a wee bit of a crier. Look at that bod! Go Kim! Have you ever been to Scotland or tried haggis? What shows inspire you (or get you a little teary eyed.. admit it!!)? Wow! That's a great swag bag! I've never been to Scotland but it's on my top 10 places to go before I die list. I was thinking about skipping the run - even though I was looking forward to it too - because of my weird foot issues, but I am a sucker for swag! I had some crappy IT issues earlier in the year - take good care of it! they are not fun. Hope you have a great race tomorrow! Sawg gets me every time, too! Its nice to pay for a race and get a little bit more than you expected. Sorry about your foot issues.. injuries are the worst part of running :( Always need to invest in some good ice packs and medical supplies (especially if you are injury-prone like me) haha. Feel better!